Sometime in the fall of 2007, Chaos came up with an idea for a new firefighters motorcycle club. Chaos worked up a design for the first colours in late 2007 and after the artwork was done, the name Inferno Firefighters MC came to be. 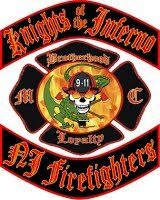 After talking with Bull, Chaos and Bull came up with the name of Knights of the Inferno Firefighters MC. After speaking with the rest of the Original Seven charter members, the name was approved. 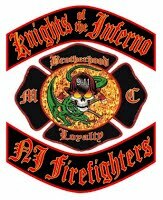 The first meeting of the Knights of the Inferno FFMC took place in February of 2008. Chaos, Bull, and some of the Original Seven charter members were part of a local chapter of the Red Knights International MC before they resigned in April 2008. An artist reworked our colours in April of 2008 and our first stitched set of colors was born.We received a loan from a local business and all the Original Seven members chipped in to buy our first twelve sets of colors. In July of 2008 we became a New Jersey non-profit organization with the help of Original Seven member Dallas. Then in March of 2009, the colours were reworked and our new colours were born. In the time that we have been around, we have gone out to support many local charities and fellow emergency & military service members in need. We have built a bond between us, not only as emergency, military, and civilians, but as fellow riders, and above all as BROTHERS! BROTHERHOOD & LOYALTY IS WHO WE ARE & WHAT WE STAND FOR. WE WILL ACCEPT NOTHING LESS! What do our colours signify? When Chaos sat down to design the colors back in 2007, he found a graphic that truly represented who we are and what we do. It has changed some since the original design, but what it stands for stays the same. The dragon: Firefighters are nicknamed "Dragonslayers" and that's where the idea for the dragon came from. This dragon represents the danger that surrounds all emergency & military service members. The skull: This represents death and the willingness to give our lives. The flaming eyes represents the death and destruction we see every day. The helmet is a tool of the trade. The 9-11 shield represents the loss of our brothers and sisters on September 11th and our commitment that we will never forget them. Chaos is a veteran volunteer firefighter with the Union Beach Fire Dept. of Union Beach NJ. Bull is a former volunteer firefighter with the Keansburg Fire Company. He is currently active with the Keansburg EMS & East Keansburg Fire Company of North Middletown NJ. Taco is a volunteer firefighter with North Centerville Volunteer Fire Company of Hazlet NJ.